Home › Coding › How to Start in Coding: No Fear! How to Start in Coding: No Fear! You do not need to have a full understanding. A couple years ago when I did Code.Org for the first time with my students, a few students got further on the levels than i did. I encouraged it, and those students helped struggling learners. The kids enjoyed the leadership. I learned that I didn’t have to have all the answers, and students were challenged. We did the “hour of code”, which honestly turned into a week of coding. Students earned certificates and then Code.org became what they did after they were done with work. For the rest of the school year it became a fun place to go if their work was done. They could either go practice their typing or work on coding. Many opted for coding. (Keyboarding is an important skill, but students keep up with that for homework as well as the 6-8 minute warm up in my class each day). It wasn’t until a couple years later (December 2015), that I decided to go through all the levels of Code myself. Though I know the coding in Code.Org very well, Interestingly enough, I do not give my students much help. Honestly I give them less help now than I did when I was learning myself! It’s the challenge which will make them grow stronger. When they struggle I ask them questions. I want them to be challenged and figure out the answers themselves. It is not a race, the understanding is the most important part. 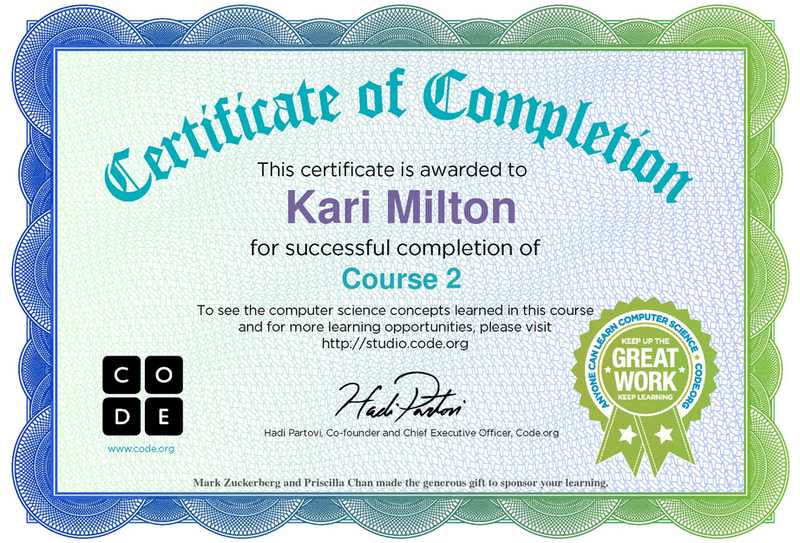 Students are required to earn the hour of code certificate, but beyond that students go at their own pace. I will guide them along the right path, and if they get stuck, I will ask the correct questions until they figure it out. But they have to figure out the solution. I firmly believe that all kids should have a coding background. it’s not just for computer programmers either. Students will need to market themselves in the future. If they decide to be a carpenter or a ballerina, having coding experience can help them create a program that could help them with their profession and market themselves for careers in their futures.